Come and join everyone at the fire station in Kurayoshi on Sunday, October 14, at 1:30pm to learn more about how to prepare for and how to keep yourself safe during emergency situations. This workshop, sponsored by the Tottori Prefectural International Exchange in cooperation with the Kurayoshi Fire Department, is free for anyone to attend and there will be English, Chinese, and Vietnamese interpreters available. Click on the image below to access the English flyer for the event. Part of a chain of supermarkets found throughout Tottori and Shimane, Marugo is your typical mid-priced grocery store, with a good selection of fresh meat and produce, pre-made meals, etc., and a limited selection of household necessities. The Hawai location is also conveniently located next to the Wellness drugstore along Route 179. Offering a slightly different selection of products, including an in-store bakery, Ajiso is another reasonably-priced chain supermarket found in Yurihama. It is also found along Route 179 near the Lawson convenience store’s Tajiri location. Yume Mart is a small farmers market featuring a variety of locally-grown fresh seasonal fruits and vegetables, fresh meat, breads, tsukemono, local goods, and more. There is also a confectionary corner with small cakes and sweets available. Yume Mart is located near the Yurihama Town Hall and JA Tottori Bank’s Hawai Branch and is found in the same building as a small Poplar convenience store. The Tottori Prefectural International Exchange Foundation (TPIEF・鳥取県国際交流財団) offers various language support services (including interpretation services and volunteer language tutors), holds Japanese classes and workshops, has libraries of study materials, and provides useful information about events and daily life in Tottori. English and Chinese International Coordinators are also available to answer questions or just to chat. It is a wonderful organization that works to support foreigners and foreign residents living Tottori Prefecture, and we encourage you to take advantage of their services as needed. As part of the Social Security and Tax Number System (社会保障・税番号制度　shakai hoshō zei bangō seido) being implemented in Japan, “My Number” is the nickname for the 12-digit individual number being issued to all individuals holding a residence record with a municipality in Japan. This includes foreigners staying in Japan who are registered as residents with an address in Japan staying for a medium to long-term period of time (not for tourism purposes). Starting from January 2016, these numbers will be used when completing procedures for social security, taxation, and disaster response. This system is meant “to improve administrative efficiency, enhance public convenience and realize a fairer and more just society.” Through this strengthened information infrastructure, the Japanese government hopes to reduce the documentation necessary for certain administrative procedures, prevent unfair payments and tax evasion, and reduce inefficiencies. Please note that while you may apply to change your individual number if it is stolen and abused, the 12-digit individual number is intended to be used for your entire lifetime (even if you leave and then re-enter Japan or change residences), so please be careful with its use. Municipal governments started sending out the notification cards relating to “My Number” in October of 2015. These include the actual Individual Number notification card, the Individual Number IC card application form and return envelope, and an explanatory pamphlet (Japanese). Be sure to keep this documentation in a safe and secure place where you will be able to access it as necessary. Applying for the Individual Number Card is optional and can be done any time after receiving your notification card. The Individual Number Card is a plastic IC card that displays the holder’s photo and basic information points, as well as the holder’s individual number. It may be used for various services, such as completing certain procedures online, possibly getting government certificates at convenience stores, and verifying your individual number. You may apply for the Individual Number Card by completing and submitting the application form that accompanied the notification card to your local government office, or via your smartphone or personal computer. You will also need to attach a photo of yourself taken within the last 6 months. When your card is ready, you will get a postcard telling you to pick it up at your local government office. You will need to bring your notification card, the postcard mentioned above, a valid form of picture identification (such as a driver’s license), and your Basic Resident Registration Card (if you have one). You will return the notification card and the Basic Resident Registration Card (if applicable) at that time. Call Center Hours: 9:30 a.m. to 22:00 p.m.
※Languages: Japanese, English, Chinese, Korean, Spanish, and Portuguese. ※Available through September 29, 2017. ※Excludes national holidays and weekends. 外免切替： .。・Switching to a Japanese Driver’s License・。. This past June, I went through the process of switching my license to a Japanese driver’s license and wanted to make a post for anyone wanting to switch from a foreign driver’s license to a Japanese driver’s license. It may seem a bit daunting, but it is actually quite straightforward (and doable) once you get the ball rolling. Just as a disclaimer, this is based on my experience as an American switching my license in Tottori while holding a valid International Driving Permit. Your experience may be a bit different based on nationality, location, timing, etc., but overall should be about the same. You can get this at the Japan Automobile Federation (JAF), foreign embassies and consulates in Japan, or the licensing authority that originally issued your license. ※The translation must be issued by one of the above. Your foreign license must be valid. You must have held it for 90 days before coming to Japan. ※If you have to renew your license before coming to Japan, make sure you do so more than 90 days before your departure to Japan. Another option is to bring your expired license as well as the renewed license to prove that you held a license for more than 3 months before coming to Japan. I got my translation from the JAF Tottori branch, so the details below are based on the current (2015) JAF requirements and process. ※Mine came the next day, so I think this depends on how busy the center is. Regardless, it is probably better to plan accordingly and leave plenty of time, just in case. After obtaining the translation of your foreign license, you are able to set up an appointment with your local driving center for submitting your documentation for review, as well as an interview concerning the process of how you got your license. I set up the appointment for my interview/document submission at the Yurihama Driver’s License Center (it was held in the afternoon- there may be certain hours when the driving centers will hold the interviews, so please check with wherever you are applying). ※For anyone who does not speak Japanese, an interpreter is needed as the interview is conducted in Japanese (if you are a resident of Yurihama and need an interpreter for your driver’s license interview, please contact the Town Office Planning Division). You first submit the documents required (see below) and will wait a while those are reviewed before beginning the interview. The interview is primarily based on the process you went through in getting your foreign driver’s license. ※You might want to take some time to recall the steps, dates, log hours, and other requirements you went through in getting your license. I found that I had forgotten a bit regarding my driver’s education course and the timing between the written and driving portions of my US driving exam. When this is finished, you will wait a few days while a report regarding your license is approved. After you hear about the results of the interview and document inspection, you are able to set up an appointment for your vision and hearing tests, the written portion of the examination, and the driving portion of the examination (if you have time and would like to, but you are not required to take it at that time). I also set up the appointment for the examination at the Yurihama Driver’s License Center. As with the interview/document submission, this was held in the afternoon. The application fee was ￥2,200. If you need to retake the driving portion of the test, you will have to pay the application fee each time you go. The tests run for the vision and hearing portion are the usual ones you would expect. Nothing too strenuous. The written portion of the driving test includes 10 questions. You must get 7 out of 10 correct in order to pass. Overall, it is not too difficult and is not the test that the Japanese citizens would take. While it is generally based on common sense and basic driving rules, it might be a good idea to review Japanese road signs and basic Japanese driving laws. I chose to take the driving portion on the same day as my written exam. Before the actual test, they have you watch a video (it is a little under 30 minutes, if I remember correctly). It was in Japanese and a little bit dated, but still applicable and had some good reminders and tips for the driving test. There will usually be another person taking the test who would ride along with you (and you would sit in the back while they take their test as well). I was the only one taking it in the afternoon, so they had one of the employees sit in the back of the car while I drove. In Yurihama, the this portion is held on a driving course with two general patterns that the center alternates between. The test administrator will tell you what to do during the test, so you fortunately do not need to memorize these. You may have an interpreter, but I would also recommend at least reviewing common driving commands for turning right/left. With the exception of the optional driving test following the written exam, the driving portion is held in the morning. You do not need an appointment, but it is a good idea to go early to ensure you are able to take the exam. Your license will be issued on the same day you pass the exam. The issuance fee when I went was ￥2,050. As you may have already heard, it is difficult to pass the driving portion on the first try- but not impossible! I think it is important to be aware of some of the habits you have formed over the years and recognize which ones you might want to avoid while taking the exam. My general advice would be to be sure to check your mirrors and environment during the test and err on the side of caution. Check at the intersection for other cars and bicycles- even if you have the green light at the intersection. Also remember to check your blind spots and remember there is no need to rush. You should use your blinker starting from 30 meters away and use the hand-over-hand method when making turns. Leave your blinker on for 3 seconds before changing lanes, and if you accidentally go up on a curb, stop and reverse. ※Just a reminder- you want to make sure that you apply for a Japanese license BEFORE your international driving permit expires (and with enough time left to allow for processing, rescheduling, or any possible hitches that could come up). 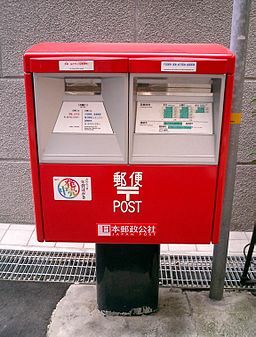 Japan Post has a useful bilingual chart that you can print out and take to the post office to help you communicate with post office staff to help you send letters and parcels, request re-delivery, change your address and more. Available in English, Chinese and Korean. You are currently browsing the archives for the Community Support ・ 生活支援 category.